I don’t know what it is, apart from sheer scale (did you notice two grand pianos onstage? ), that makes this piece so popular, bringing shivers to the spine or tears to the eyes. I doubt it can be the sentiments of the words, displayed on subtitles here, which are lost on most hearers because they are in mediaeval Latin. And there’s the uneasy business of its origin in Nazi Germany in 1937, too. But the idea of fortune’s wheel is one of those perennial themes in history, like the Great Chain of Being, which may even now resonate with popular feeling. The idea of Fate’s Wheel was based on the classical goddess Fortuna, who seems to have combined a rather mechanistic determinism with caprice. The former is shown in the slow turning of her wheel, giving dismally predictable cycles of good and bad luck, whose origin is of course closely related to the fatalism of classical astrology and of that other big cyclical idea, the Great Year. The second is seen in the flaky goddess’s tendency to lurch in whatever direction the ground happened to tilt. It seems the idea was christianized through the philosopher Boethius, and was used didactically in mediaeval times to show that pride comes before a fall. But to the theologian Thomas Aquinas, living in the same century that Carmina Burana was written, “fortune” and “chance”, though admitted as phenomenological truths, were clearly taught to be resolved in the wise counsels of God’s providence – as I’ve discussed before with reference to the limitation of randomness in evolution. 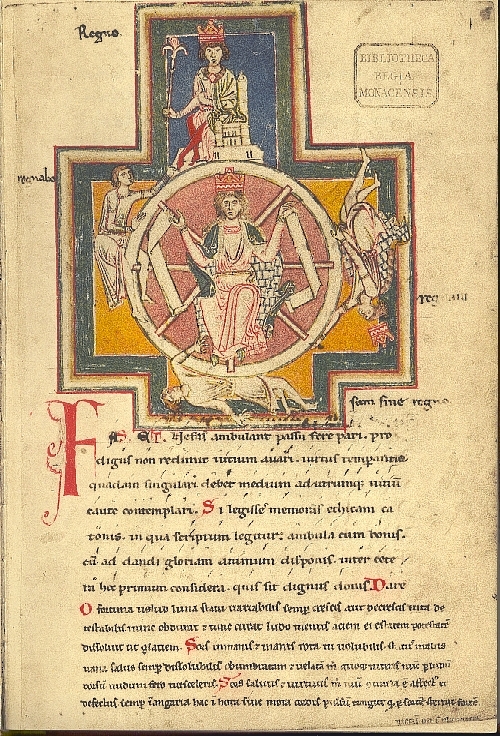 Now the cycle of profane poetry called Carmina Burana was written either by cynical thirteenth century monks or by the unemployed intellectuals called Goliards. These were a by-product of the custom of the eldest son inheriting the estate, which led to a plethora of younger sons going off to university to do theology, and then finding no jobs available on graduation – plus ça change, plus c’est la même chose. Accordingly they wandered around Europe drinking, womanising, drawing cartoons of the Prophet and so on. But isn’t it interesting how, in jettisoning pretty well all remnants of Christian faith, belief in the gloomy teaching on fate that had, more or less accidentally, been assimilated into the Church remained pivotal in their world view? Why should it have been that it was so much more natural to believe in a blind and malevolent force intent on grinding you down (which, nevertheless, let you prosper half of the time) than in a hidden God whose wise providence brings down the proud and tests the rest of us from time to time? I’m hesitant to ascribe a strong belief in luck to the educated section of society today, and even more to assert the direct continuity of the old idea of Fortuna in our culture. The wheel of fortune does indeed crop up in occasional songs and novels, as well as in bastardized form in quiz shows. But by and large “Lady Luck” is depersonalised today, and is represented dispassionately as probability, purposelessness and so on. Nevertheless, the default position of those who wish to do without God is pretty compatible with that of the apostate mediaeval scholars, as is shown in Richard Dawkins’ famous quote: The universe we observe has precisely the properties we should expect if there is, at bottom, no design, no purpose, no evil, no good, nothing but blind, pitiless indifference. That perceived indifference, which pretty strongly implies malevolence, particularly in a biological world “red in tooth and claw”, is attributed both to the outworking of regular law (the inexorable turning wheel) and to mere chance (Fortuna’s flaky disposition). But though the goddess was seen as half-mad, she was not completely without purpose: even the mediaeval Goliards and Jongleurs recognised that if you were in the gutter you could expect to rise once more: their coin had two sides. So, of course, did that of Thomas Aquinas, though to him there was reason even in the downside of life. You can account for the difference between the two mediaeval groups of intellectuals not only religiously but sociologically: the cynicism of the Goliards was fed by being overqualified and underemployed, and by giving in to an abandoned and unproductive lifestyle. I wonder what comparable pathology accounts for the attraction of purposelesness to so many academics today? This entry was posted in History, Music, Philosophy, Politics and sociology, Theology. Bookmark the permalink.